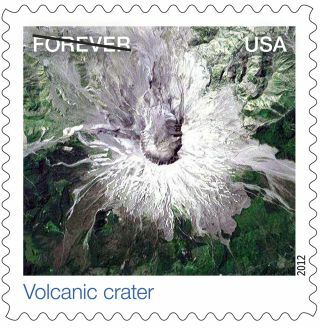 Earthscapes "Forever" stamps are being issued by the U.S. Postal Service. If you head out to buy some stamps next week, you're in for some spectacular views. The latest set of "Forever" stamps from the U.S. Postal Service will feature a range of bird's-eye views of Earth — from natural to agricultural to urban — from satellites and photographers in airplanes. The stamps will be released on Monday (Oct. 1). The next five stamps show five products being gathered, grown or harvested: salt, timber, grain, cherries and cranberries, according to a statement from USA Philatelic, a magazine that covers U.S. stamps. Urban scenes finish out the set with images of winding highways and tidy subdivisions seen from overhead. The images of the volcano crater and the center-pivot irrigation were taken by the NASA/U.S. Geological Survey Landsat 7 satellite. Such satellites are used to understand Earth's changing climate, monitor changing landscapes and see how humans are altering the planet's surface.